The interesting thing about writing is that the skill is transferable from one industry to the next. Sure, it helps to have an intimate understanding of the topic you’re writing on, but that can be researched. The key skill – your ability to craft sentences and write persuasive copy – is fully transferable. Keep this in mind as you look for new gigs and take a look at the following industries where demand is at an all-time high. The real estate industry is one of the first places to look. As Houston-based Green Residential points out, “Approximately 33 percent of first-time home and apartment hunters begin their research online, and 92 percent of shoppers end up going online for some of their research.” This creates a huge need for fresh content and gives you a chance to pounce in and pick up some accounts. With the real estate industry being so massive, it helps to narrow your search for clients down to those in your local market. Clients will be much more receptive to your offer if they believe you’re familiar with the market and have a basic understanding of neighborhoods and area amenities. The interesting thing about the e-commerce industry is that it needs content in order to thrive. It’s nearly impossible for an e-commerce company to be successful if it doesn’t have some sort of content strategy to drive backlinks, SEO rankings, and traffic from social media and other referral sources. Knowing this, you can put together some targeted pitches and deliver them to various sites where you see potential. As long as there’s money, personal finance will continue to be a hot topic for working class people. And because of the self-help nature of the industry, digital content will always play a major role in this space. Personal finance blogs are a dime a dozen – and most are run by a single entrepreneur. 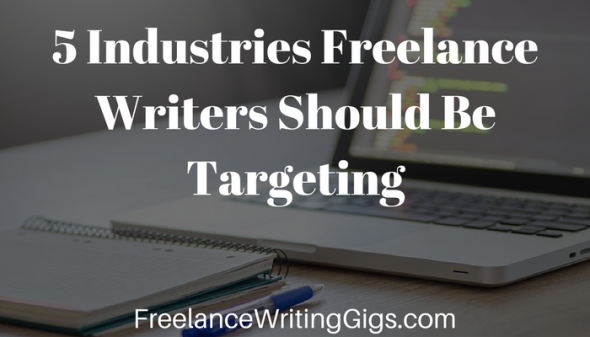 However, if you do your research and find some of the hotter blogs and companies in the industry, you’ll find that they’re often looking for more writers to help them keep up with demand. By making the right connections, you can add some steady clients here. Healthcare is another industry where people are always looking for help. And when people want answers to their questions, they turn to the internet. This creates a huge opportunity for healthcare specialists to reach potential clients via fresh and unique content. Obviously, it helps if you have some sort of background in healthcare, but it isn’t absolutely necessary. Most freelance writers overlook the legal industry because they assume it’s too hyper-focused and technical for them, but you’d be surprised how many attorneys and firms are looking for writers to simply generate “searchable” content to drive traffic to their pages. Finding these opportunities may prove lucrative for you as you continue to grow your client base. Let these industries be a starting point and nothing more. As a freelance writer, you never want to limit yourself to just one or two niches. By keeping your options open, you can maximize your earning potential and seize opportunities as they emerge.